My birthday falls in March. When I was growing up, we would often get an ice cream cake as our birthday cake. You ate all the leftover cake by yourself when it was your birthday. My brother's family eats all the leftover cake for breakfast the next day. It prolongs the celebration a little bit longer. I believe in celebrating your birthday for at least a week. One day isn't nearly enough time to commemorate your birth. I ate this cake the weekend before my birthday with friends. It was phenomenal. It was better than the cake I ate last year for my birthday. I can say that because I made both cakes. I like baking, and I enjoy making my own cake. I plan it several weeks in advance. The dark chocolate cake recipe came from food.com. The chocolate chip cookie dough frosting recipe came from allrecipes.com. The ganache recipe came from epicurious. It was supposed to be a caramel ganache, but I wasn't convinced. I don't think I let the sugar caramelize long enough before adding the cream. The ingredients for the cake are 2 cups sugar, 1 3/4 cups flour, 3/4 cup cocoa, 1 1/2 teaspoons baking powder, 1 1/2 teaspoons baking soda, 1 teaspoon salt, 2 eggs, 1 cup milk, 1/2 cup vegetable oil, 2 teaspoons vanilla extract, and 3/4 cup boiling water. The ingredients for the chocolate chip cookie dough frosting are 3/4 cup packing light brown sugar, 1/2 cup room temperature butter, 1 1/4 cups flour, 1 teaspoon vanilla, 1/2 teaspoon salt, 1/4 cup heavy whipping cream, and 1/2 cup miniature chocolate chips. The ingredients for the ganache are 8 ounces semisweet chocolate, 1/2 cup sugar, 1 tablespoon water, 1 teaspoon lemon juice, 1 cup heavy cream, and 2 tablespoons butter. I prepared the cake batter first. I greased and floured two nine inch cake pans. In a bowl, I added the sugar, flour, cocoa powder, baking powder, baking soda, and salt. I whisked all the dry ingredients together. I whisked these together for two minutes. The recipes suggests using a mixer, but I did it by hand. I stirred in the boiling water. It looks weird, but I wasn't afraid. It is a very wet cake batter. I evenly portioned out the batter into the prepared pans. I baked the cake for 30 to 35 minutes at 350 degrees. I let the cakes cool for 10 minutes before removing them from the pans and letting them cool completely on a rack. I prepared the ganache while the cakes baked because the ganache needed time to cool as well. I put the sugar, water, and lemon juice into a saucepan over medium heat. I let this cook until it because a dark amber. I never stirred. Sometimes I swirled the pan, but I doubt that had any effect. Once it was a dark golden, I took the pan off the heat. I added a third of the cream and stirred. Once it stopped bubbling, I added the rest of the cream while continuously stirring. I stirred in the butter. I don't think I caramelized the sugar long enough before adding the cream. It did not bubble violently when I added the cream, and the ganache did not taste like caramel. I poured the caramelized sugar over the chocolate. I chocolate had been cut into small pieces. After I let the hot sugar mixture melt the chocolate for a few moments, I stirred until there were no clumps. I let the ganache cool down in the fridge for a couple of hours. To make the chocolate chip cooking dough filling, I beat the brown sugar and butter until it was creamy and smooth. I stirred in the flour, vanilla, and salt. I slowly mixed in the cream. I added a little more cream than directed because I wanted a smooth and spreadable consistency. I stirred in the best part: the mini chocolate chips. 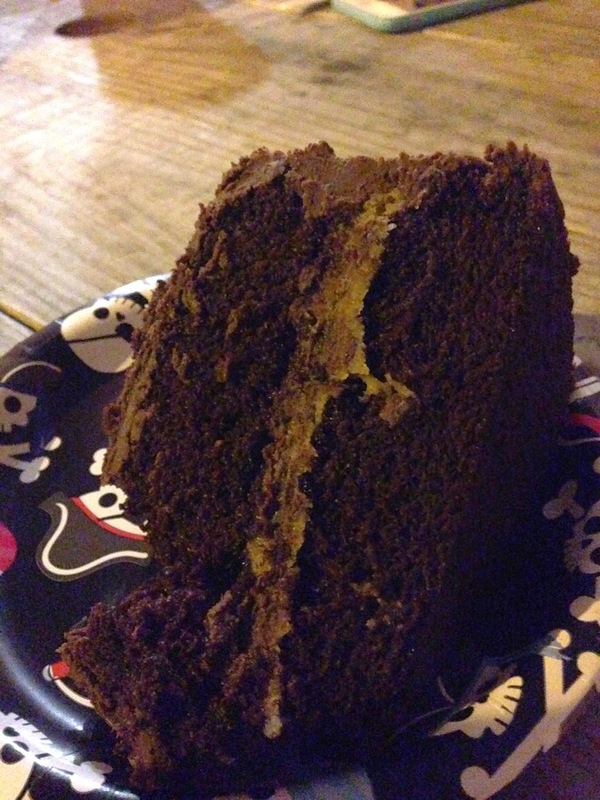 I put all the pieces of the cake together once the chocolate cake was completely cool. I put a thick layer of chocolate chip cookie dough on top of the first layer of chocolate cake. I used all of the frosting. It was thick but not overwhelming. I put the second layer of cake on the chocolate chip cookie dough and smoothed out the sides with the filling. I slathered on the thickened ganache. I started with the top and then worked on the sides. I was heavy handed with the ganache because you can never have too much chocolate. I don't know the last time you ate a slice of cake, but I doubt it was this delectable. The cake was incredibly moist. 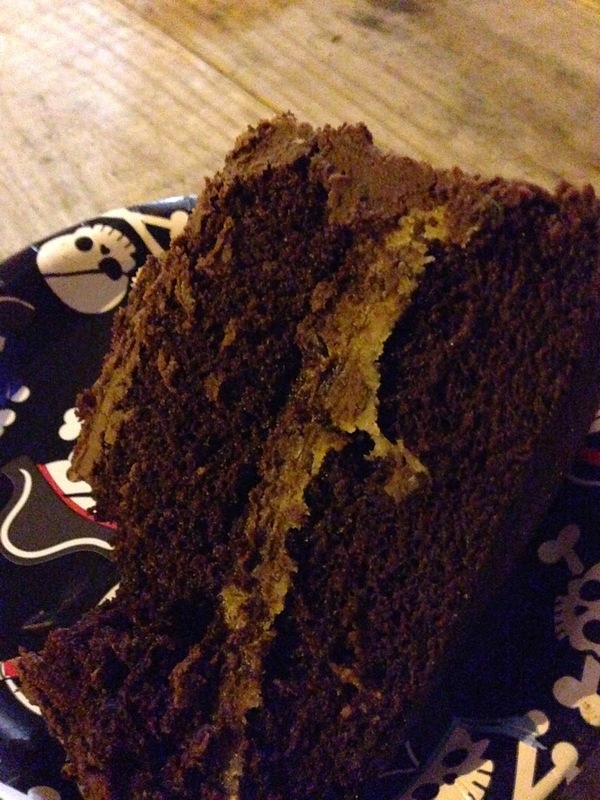 It was so moist I was afraid it would be too unmanageable to make a layer cake. My fear was unfounded, but the texture was superb. The filling tasted exactly like cookie dough, one of my greatest weaknesses. The ganache was rich, creamy, and decadent. I could have eaten it by the spoonful. This cake was so extravagant it was practically sinful. I whole heartedly endorse all of the recipes I used. They combined into a pleasurable and luscious treat. I'm dying to get my fork in there! A cookie dough filling is insane for an idea. I mean it should be illegal how sinfully good this is! Thanks Kelsey! It was a pretty great cake!